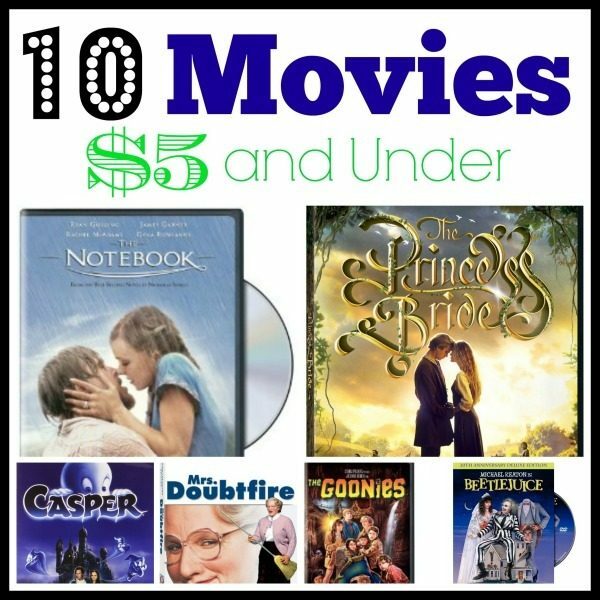 10 Movies For $5 and Under! You are here: Home / Great Deals / Amazon Deals / 10 Movies For $5 and Under! I am always looking for good deals on movies to add to our home movie collection! If you’re like me, you’re going to love today’s roundup – 10 movies for $5 or under! The Notebook – $3.99 + FREE shipping! Beetlejuice – 20th Anniversary Deluxe Edition – $3.99 + FREE shipping! The Goonies – $4.63 + FREE shipping! Good Will Hunting – $4.82 + FREE shipping! Mrs. Doubtfire – $4.99 + FREE shipping! Casper – $4.99 + FREE shipping! Contagion – $4.99 + FREE shipping! The Land Before Time – Anniversary Edition – $5 + FREE shipping! Liberty’s Kids – The Complete Series – $5 + FREE shipping! The Princess Bride – $5 + FREE shipping!